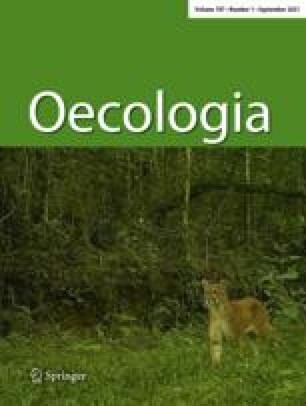 The long-term persistence of obligate mutualisms (over 40 Mya in both fig/fig wasps and yucca/yucca moths) raises the question of how one species limits exploitation by the other species, even though there is selection pressure on individuals to maximize fitness. In the case of yuccas, moths serve as the plant's only pollinator, but eggs laid by the moths before pollination hatch into larvae that consume seeds. Previous studies have shown that flowers with high egg loads are more likely to abscise. This suggests that yucca flowers can select against moths that lay many eggs per flower through selective abscission of flowers; however, it is not known how yucca moths trigger floral abscission. We tested how the moth Tegeticula yuccasella triggers floral abscission during oviposition in Yucca filamentosa by examining the effects of ovipositor insertion and egg laying on ovule viability and floral abscission. Eggs are not laid at the site of ovipositor insertion: we used this separation to test whether wounded ovules were more closely associated with the ovipositor site or an egg's location. Using a tetrazolium stain to detect injured ovules, we determined whether the number of ovipositions affected the number of wounded ovules in naturally pollinated flowers. Two wounding experiments were used to test the effect of mechanical damage on the probability of floral abscission. The types of wounds in these experiments mimicked two types of oviposition—superficial oviposition in the ovary wall and oviposition into the locular cavity—that have been observed in species of Tegeticula. The effect of moth eggs on ovule viability was experimentally tested by culturing ovules in vitro, placing moth eggs on the ovules, and measuring changes in ovule viability with a tetrazolium stain. We found that ovules were physically wounded during natural oviposition. Ovules showed a visible wounding response in moth-pollinated flowers collected 7–12 h after oviposition. Exact location of wounded ovules relative to eggs and oviposition scars, as well as results from the artificial wounding experiments, showed that the moth ovipositor inflicts mechanical damage on the ovules. Significantly higher abscission rates were observed in artificially wounded flowers in which only 4–8% of the ovules were injured. Eggs did not affect ovule viability as measured by the tetrazolium stain. These results suggest that physical damage to ovules caused by ovipositing is sufficient to explain selective fruit abscission. Whether injury as a mechanism of selective abscission in yuccas is novel or a preadaptation will require further study. We thank Lindsey Elms for help with the artificial wounding experiments, Chad Huth for his advice in the early stages of this project, Holly Bonar and Michael Lacey for help with seed counting, and Kari Segraves and two anonymous reviewers for comments on an earlier version of this manuscript. This work was supported by NSF (DEB 95-09056) and a Natural Science Grant from Vanderbilt University to O. Pellmyr.